It has been so nice being on holidays. I have done everything I wanted to do but, regrettably, in a few days I go back to work. Sigh. I have been busy knitting fun socks...pretty colors...easy peasy, just plain satin stitch and instant gratification. 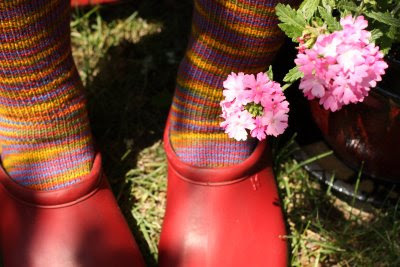 I love my colorful garden clogs and - of course - one must have socks to match each color! I have also done a little bit of shopping - on Etsy of course. 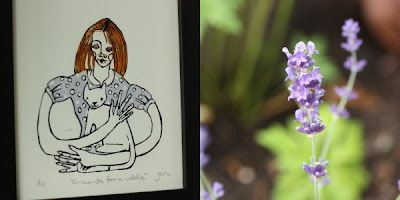 The little print pictured above was made for me by Jennifer from littlebird. You can view her prints here. I love this print because Jennifer incorporated a little white kitty like my Tencents and included her name in the title and she stylized the girl in the picture to have some of my elements. This little print will grace the wall of my newly finished sewing/knitting room. The weather has been cooperating and nothing has been hailed on...so far. Most of my plants have recovered. The only thing I am battling right now is - cats. Now...I love cats, I have a cat, but I dislike cats pooing in my garden. I had a beautiful head of a day lily, almost ready to bloom, broken off by a bad pooing cat!! I went to the garden center and was told that one of the best solutions is to over-plant the bed as cats like to have space to dig. If a bed is over-planted, they typically will not dig. Also, I planted some English Lavender, which cats apparently do not like. If anyone has any other non-hurtful suggestions for keeping cats out of my garden, I would like to hear them.